This is a no-brainer about which I am somewhat embarrassed that it took so long for me to make. In my defense, I have never been a big fan of chili powder. Although I grew up in Texas, I was not exposed to much Mexican food (what we called Mexican food anyway; it was actually Tex-Mex) until after we had moved to Dallas from Houston when I was in the sixth grade. I do have one memory of going to a small fast food-type restaurant in Houston when I was in elementary school where my father ordered tacos for everyone and I did not care for them at all. The tacos consisted of dry pieces of beef folded inside of circles of something soft that looked almost like a pancake but tasted nothing like one. This was long before the ubiquitous presence of Taco Bell (I am not sure there even were any in Texas at that time) so I did not even know what a taco was supposed to be. Needless to say it was a long time before I had the slightest desire to sample any more Mexican Food. Back in Dallas we would occasionally go to El Fenix or El Chico and order the enchilada plate. This was about the same time that my mother discovered crispy tacos and Lowry's taco seasoning mix and taco night was brought into our monthly meal rotations and my brother, coming home from college in Austin, introduced us to his version of nachos - plain doritos with cheddar cheese melted on them topped with jalapenos and brioled. Not long after that we discovered avocados, and guacamole replaced Lipton's Onion Soup dip as the party dish of choice. Back in Austin for college I explored as many Mexican restaurants as I could, where I discovered such wonders as migas, huevos rancheros, chiles relennos, mole, breakfast tacos, and chorizo. A friend of one of my housemates from the valley cooked up my first ever taste of fajitas in the fireplace of the huge house we were renting west of campus and another housemate introduced us to cilantro and life was complete. What does this trip down memory lane have to do with chili powder? you may ask. Very little, as a matter of fact. There were only two dishes I made where I used chili powder. The first was the chili that I had grown up eating that my mother made with a recipe she brought with her from Chicago that had tomatoes and beans in it and was basically just ground beef, onions, a can of tomatoes and a can of kidney beans with a tablespoon of chili powder added to it. And when I finally got brave enough to make enchiladas I used chili powder in the sauce. Chili powder has such a specific flavor profile that I associate so closely with chili that I do not find that I have much use for it outside of those two dishes. So a bottle of chili powder could easily last me a few years. In fact, I only recently used up the last of the bottle I bought somewhere around 2013. And by recently, I mean sometime within the last year and long enough ago for me to have forgotten that I did not have any when I went looking for it to use in a new recipe I wanted to try and that is when I remembered that I did not have any. So I decided that it was time to just make my own instead of buying it pre-blended. As usual, I looked at several recipes online until I found a combination that made the most sense to me. What I ended up with was the perfect blend of garlic, cumin, paprika and oregano. You might notice that there is something missing from this recipe, and that would be the chili. That was an intentional oversight. Ever since I discovered that ever pepper has a unique flavor profile and a different kind of heat I have been collecting them. 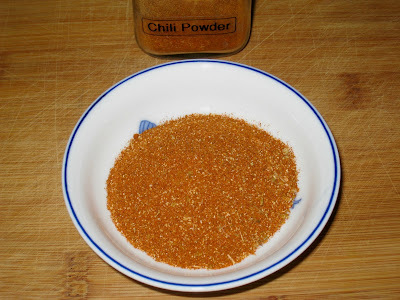 It is no longer enough to have cayenne and red pepper flakes only in my spice cabinet. In addition to the whole dried guajillo, pasilla, ancho and chilies de arbol (not to mention my latest discover of Korean chili threads) currently in my whole dried pepper drawer, I have ground aleppo, urfa, aji amarillo, and pasilla peppers as well. I was trying to decide which one to add to my chili powder when I realized that if I didn't add any of them to the basic mixture, I could add whichever one I wanted when I was ready to use it, which effectively gives me five (at the moment) kinds of chili powder I can have at my disposal that would best suit the flavor profile of the dish I am making. I actually even left out the cayenne on this mixture for the same reason. So what was at one time something I would only use once or twice year has become something I find myself reaching for all the time. And it takes literally minutes to make.